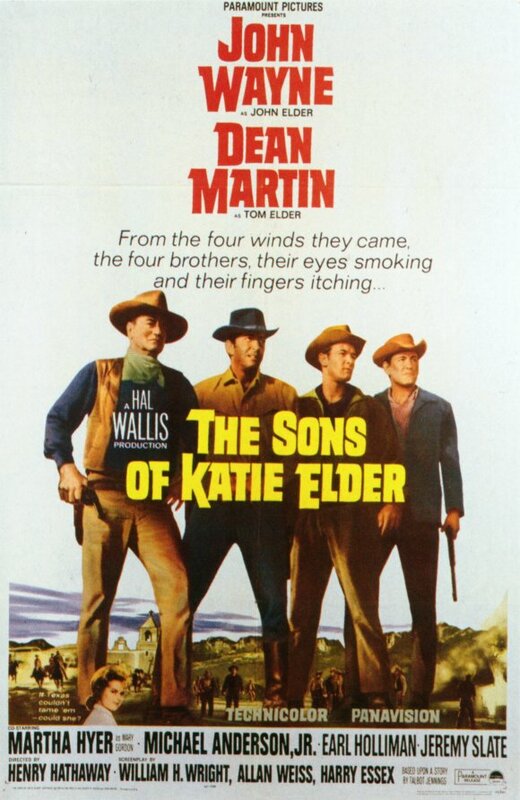 There is no Katie Elder in this film; she has died and the movie starts with her ca. 1898 funeral in Clearwater, Texas. Three of her four sons are in attendance, with the oldest watching from a nearby hill. 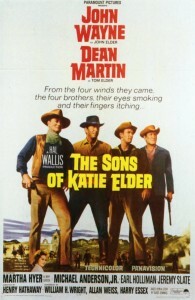 The four brothers are John (John Wayne), a well-known gunman who hasn’t been home in ten years; Tom (Dean Martin), a gambler who has also been gone for years; Matt (Earl Holliman); and Bud (Michael Anderson, Jr.), who has been going to the Colorado School of Mines for the last year but whose continued education there is in question. None of them appear to have formed their own families or relationships that we see. Katie had been living in semi-poverty since the death of her husband Bass Elder several months previously under suspicious circumstances. Her former ranch is now owned by large landowner and gunshop proprietor Morgan Hastings (James Gregory), who is outwardly friendly but worried about John Elder’s presence. 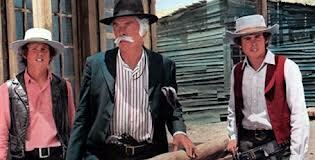 He has hired gunman Curley (George Kennedy) to keep an eye on John’s comings and goings. Meanwhile the Elder brothers are trying to find out more about their mother’s circumstances and death. Her best friend was a young woman named Mary Gordon (Martha Hyer), who is given to reminding the brothers how little they had been around. Local sheriff Billy Wilson (Paul Fix) also worries that the brothers will stir up trouble, although he also worries about his own overzealous deputy Ben Latta (Jeremy Slate), who tends to see things in uncomfortably black-and-white terms. The Elder brothers are finding that (a) their mother had a lot of grit and everybody liked her, and (b) their father was shot in the back after losing the ranch to Morgan Hastings in a card game. A man from Pecos who had corresponded with Kate Elder about a herd of horses stops by, and the Elders agree to take 200 horses and drive them to Colorado for sale, to finance Bud’s continued college career. 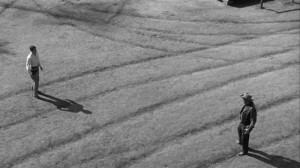 While they are gone to Pecos to get the horses, Billy rides out to where they are staying and Morgan Hastings shoots him from a distance with a rifle. As the Elders return with the horses, they are taken prisoner by a posse and put in jail, where they continue to argue over how to respond. 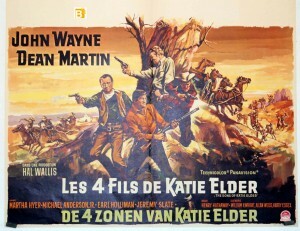 John Elder seems to win the discussion, largely by virtue of being the oldest and being John Wayne. While being transported by wagon, they are ambushed by a Hastings-led party. They manage to get a few weapons and fire back; deputy Ben Latta and Matt are killed, and John gets Curley. John, Tom and Bud make it back to town to get a doctor for Bud, who has been shot. In some ways, this is a typical “unscrupulous land baron trying to take over the entire range” movie (see The War Wagon, for example, and any number of other such westerns). 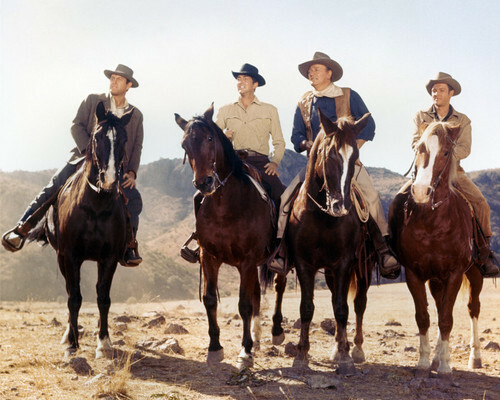 It reunites John Wayne and Dean Martin from Rio Bravo; Martin isn’t as good in this one. Earl Holliman is good but his part is underwritten; Michael Anderson as youngest brother Bud is largely just annoying. Michael Anderson Jr. was in this and as a young soldier in Major Dundee before he drifted off to television work. James Gregory and George Kennedy are good as patently bad guys. The Martha Hyer character is unnecessary and doesn’t really do much. There is a good cast of supporting character actors: Paul Fix, John Doucette, Strother Martin, Percy Helton, Rhys Williams, John Qualen et al. Rodolfo Acosta, who often played Indian chiefs (Hondo, Trooper Hook), is here one of Hastings’ gunmen. Chuck Roberson, one of Wayne’s favorite stand-ins and stuntmen, is present as well. 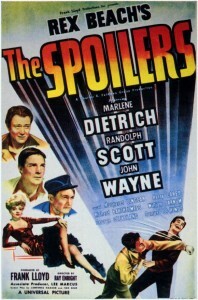 This was Wayne’s first movie after having a cancerous lung removed. He was not in good health, and he looks significantly older at 58 (playing a character who is supposedly around 40) than he had in The Comancheros four years earlier. 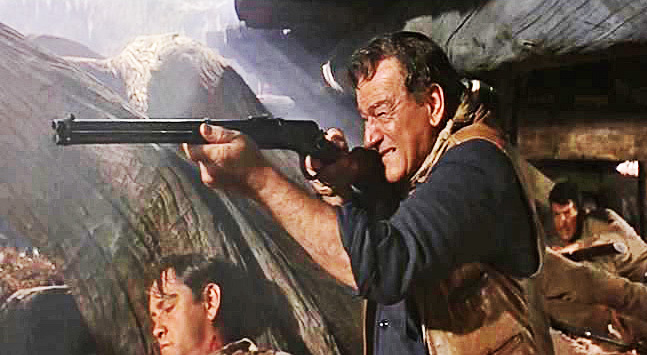 In general, this is a middle-of-the-pack John Wayne western from the 1960s—good enough but not remarkable. It was remade in a modern urban setting with Mark Wahlberg as Four Brothers in 2005. Shot in color in Durango, Mexico. Cinematography is excellent, by Lucien Ballard. Good music is by Elmer Bernstein (The Magnificent Seven, The Comancheros). The hearse featured at the funeral of Katie Elder currently resides in front of the Haunted Mansion at Walt Disney World. In western history, there was a famous Kate Elder: “Big Nose” Kate Elder, a prostitute of Hungarian origins and girlfriend of legendary gunfighter-gambler-dentist Doc Holliday. This entry was posted in Westerns Worth Watching and tagged Dean Martin, Henry Hathaway, John Wayne, Lucien Ballard, Range Wars on April 29, 2014 by Nicholas Chennault. The late 1940s and early 1950s had a lot of titles with some version of the word “badman” in them. This has a good cast, but a muddled story. Robert Ryan is Jeff Clanton, a native-Missourian major in the Union army as the Civil War is ending. He ends up capturing and administering the oath of allegiance to the remains of Quantrill’s band, including various Youngers and Jameses, before he himself is mustered out. A detective agency owner, Matthew Fowler (Robert Preston at his most weaselly, a pseudo-Pinkerton), objects and gets a mob together. Clanton shoots one of Fowler’s men as the mob threatens the now-disarmed Confederates, and they take off. Clanton is convicted of murder by a kangaroo court but is sprung before his scheduled hanging by Lily (Claire Trevor), Fowler’s estranged wife. After a lengthy escape he is reunited with the Confederates in Quinto, Indian Territory, and he leads them on raids against Fowler-protected banks and trains. Lily also shows up in Quinto, and Curley Ringo finds out her identity. Lily (Claire Trevor) offers to help Jeff Clanton (Robert Ryan) get out of jail. Cole Younger (Bruce Cabot), rather than Jesse James (Lawrence Tierney), seems the dominant personality in the group; gradually they become more violent than Clanton is comfortable with. He determines that a final train robbery will be his last; Lily is shot during it, and he, Bob Younger (Jack Beutel, notable mostly for his role ten years earlier as Billy the Kid in The Outlaw) and Doc Butcher (Walter Brennan) make their escape from Quinto. However, Lily is captured by Fowler’s men and is used as bait to trap Clanton. Clanton engineers a raid on Fowler’s headquarters during which Fowler is shot by one of his own men. Lily and Clanton presumably live happily ever after. It is never clear why Lily and Fowler are so much at odds, why she would spring Clanton in the first place and why the otherwise upright Clanton can so easily make off with another man’s wife. Ryan is good, as always; Claire Trevor isn’t given much to work with. Walter Brennan is the best character in the film. 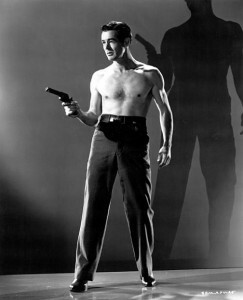 Still of Robert Ryan as Clanton. In color. The supposed Missouri and Oklahoma locations look a lot like southern California and southern Utah. Not long at less than 90 minutes. From some reason, the posters seem to emphasize a shirtless image of Ryan; he looks to be in good shape. Later in his career, Ryan would play another Clanton: Ike Clanton, nemesis of Wyatt Earp, in Hour of the Gun (1966). 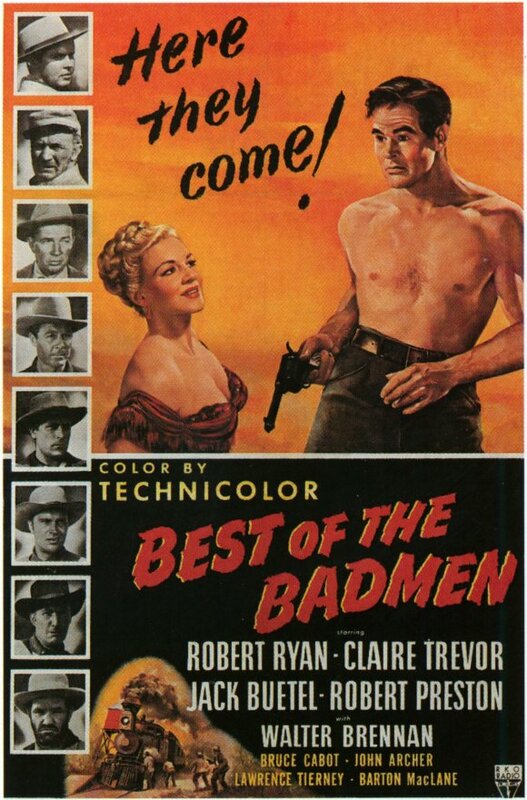 It is tempting to see this as a sequel of sorts to Badman’s Territory (1946), a Randolph Scott movie that also featured the James gang in Quinto, and Lawrence Tierney as Jesse James. Neither is very historical. 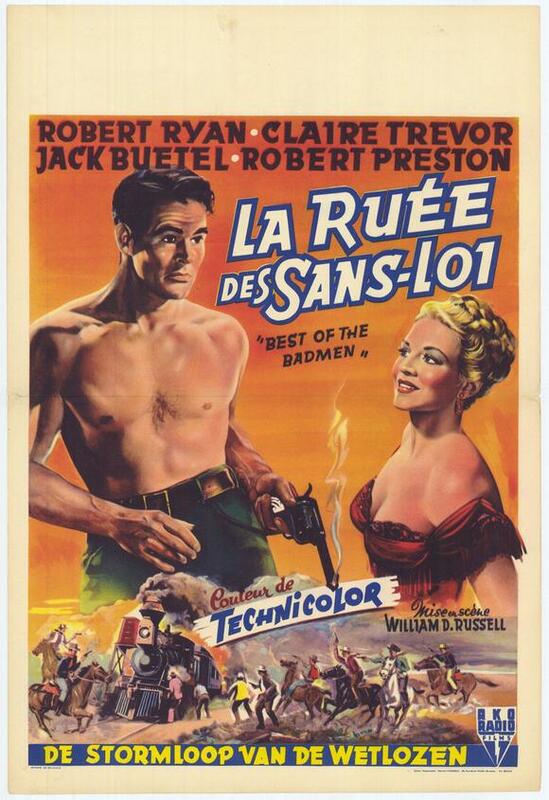 This entry was posted in More Westerns and tagged Claire Trevor, Outlaw Gangs, Robert Preston, Robert Ryan on April 28, 2014 by Nicholas Chennault. 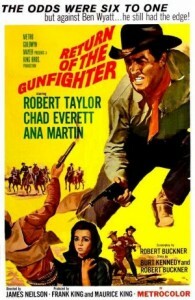 In the early 1940s, Randolph Scott had been the hero in a couple of better-than-average westerns (Last of the Mohicans, Frontier Marshal) and had persuasively played an unusually ethical villain in a couple more upscale westerns (Western Union, Virginia City), in which his character does not survive. Here he is called upon to play a charming but unambiguously bad guy for a change. 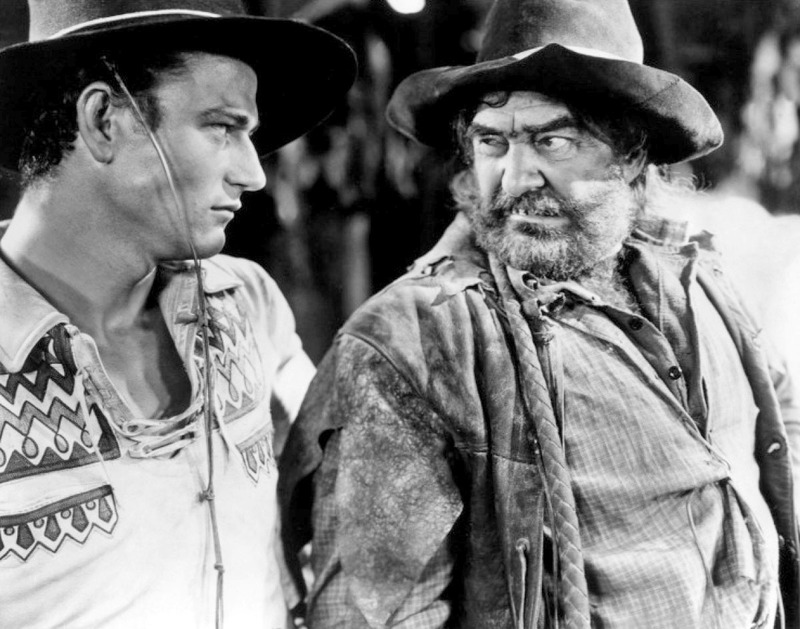 His good-guy counterpart is rising star John Wayne, three years after his star-making turn in Stagecoach. The balance between these two attractive actors makes this story work. This was not the first (or the last) cinematic version of Rex Beach’s story of claim jumping in Nome, Alaska, in 1900, but it is probably the best. Not only are the two main roles well-cast, but they are ably supported by Marlene Dietrich and Harry Carey. Cherry Malotte (Marlene Dietrich) meets Helen, the judge’s niece (Margaret Lindsay), and is not amused. Roy Glennister (John Wayne) and his mining partner Al Dextry (Harry Carey) are the proprietors of the wealthy Midas gold mine, and things are going well when new mining commissioner Alexander McNamara (Randolph Scott) shows up. Glennister has a regular relationship with Cherry Malotte (Marlene Dietrich), owner of The Northern saloon, and he’s returning from a trip to Seattle. When he does, he’s in the company of the attractive Helen Chester (Margaret Lindsay), niece of the new federal judge Horace Stillman (Samuel S. Hinds). He’s more attentive to Helen than he needs to be, and Cherry is offended. Meanwhile, questions on the legitimacy of the Glennister-Dextry ownership of the Midas have been raised, and Dextry wants to respond directly with guns. Glennister urges trying the legal way first. What it gets them is having their mine and gold impounded, with several months before their case is heard, in which much more gold can be taken out by the authorities, McNamara and Stillman. 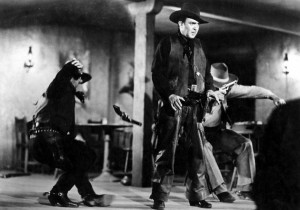 As Glennister and Dextry try to get their gold back, the local marshal is killed by Cherry’s manager-dealer Bronco Kid Farrow (played by silent star Richard Barthelmess in one of his last roles). As tensions build between Glennister and Cherry, Bronco figures the blame for the marshal’s death will attach to Glennister, giving Bronco a better chance with Cherry. It works to a point, and Glennister is jailed. 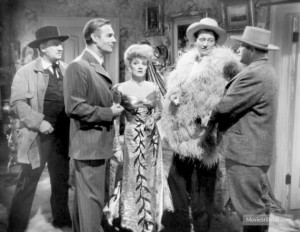 Glennister (John Wayne), while wearing feathers, gets arrested by the bad guys. McNamara hatches a plan for Glennister to be killed in an escape attempt, but Cherry gets wind of it and aids a real escape. Glennister and Dextry take back the Midas, but Bronco is mortally wounded in a train crash during the attack. As he dies, he admits he killed the marshal. Cherry has been distracting McNamara while the Midas was retaken, and now Glennister shows up at the Northern to save her from McNamara’s attentions. This leads to an epic fight, in which much of the Northern is wrecked. In the end, McNamara, Stillman and supposed niece Helen are apprehended before they can get away. The Midas is in the hands of its real owners again, and Glennister and Cherry are back together. The fight between John Wayne and Randolph Scott is one of the most storied in the history of westerns. This sequence took about five days to lay out and film. It’s unusually vigorous and well-staged, but not perfect. For example, at one point a stand-in for Scott is a little too obvious, and there are a couple of spots in which it looks like the film was speeded up. Still, in most of the key roles, the actors are a step up from the 1955 remake, for example. 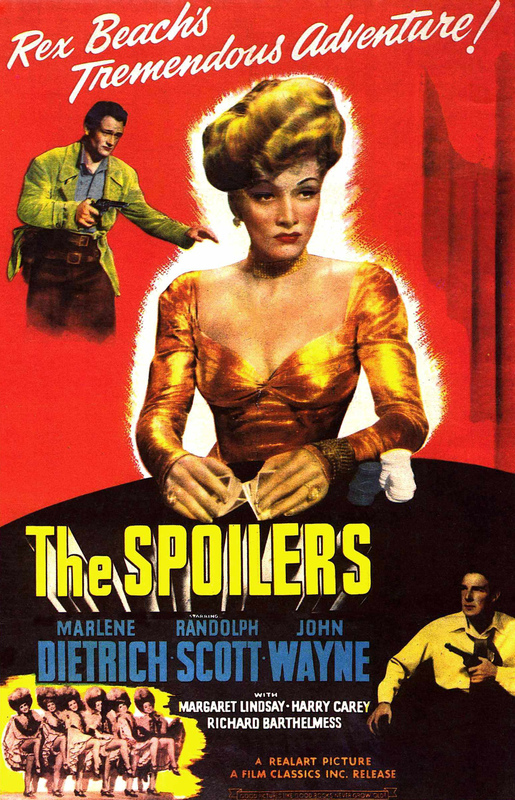 John Wayne is a better actor than Jeff Chandler, Randolph Scott is more charming than Rory Calhoun, and Marlene Dietrich did this kind of role better than anyone else (although Anne Baxter was also excellent in 1955), even if her wigs are a bit extravagant. And Harry Carey is more restrained but watchable than John McIntire. The movie is tightly-paced and works well. Randolph Scott and John Wayne wreck the Northern during an epic cinematic battle. Barthelmess is an interesting side note in one of his last movie roles, as is William Farnum, who plays the Glennister-Dextry lawyer Wheaton. He was the brother of early silent star Dustin Farnum (The Squaw Man, credited with being the first feature-length movie), and he had played Glennister himself in the 1914 movie version of the story–probably the first of five movies to use Beach’s 1906 novel as its basis. And there’s a brief vignette where Cherry encounters the poet Robert W. Service, writing about the shooting of Dan McGrew in The Northern. 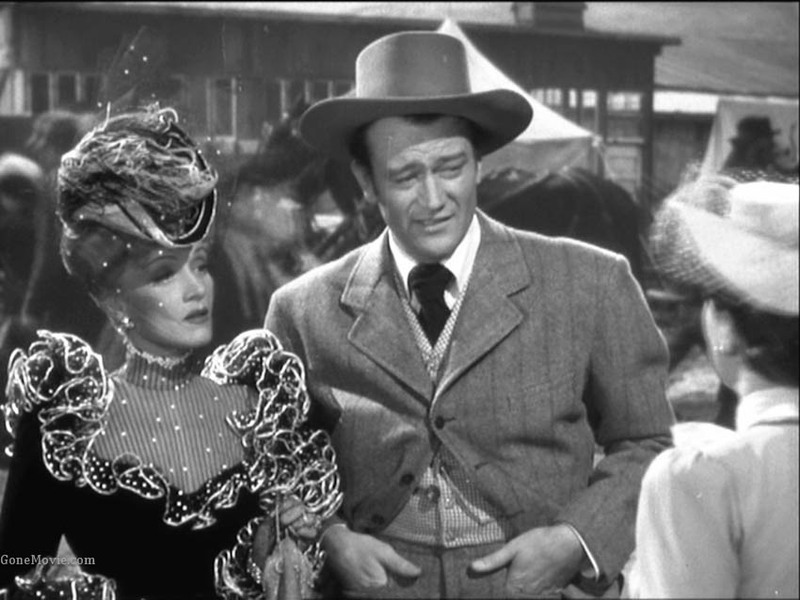 John Wayne and Marlene Dietrich were having an affair at the time this movie was made. Note that Wayne got third billing on the posters, after Dietrich and Scott. That would not long be the case. 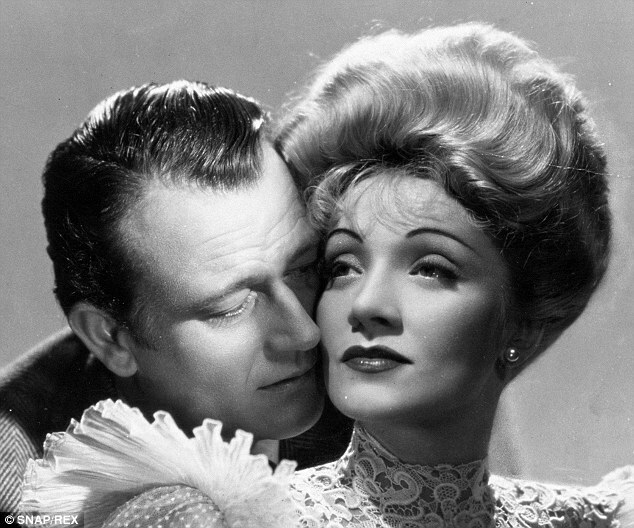 Wayne and Dietrich have good chemistry in their relationship, perhaps because it mirrored their three-year affair in real life. This was also Wayne’s first opportunity to appear in a film with Harry Carey, who had long been a mentor. 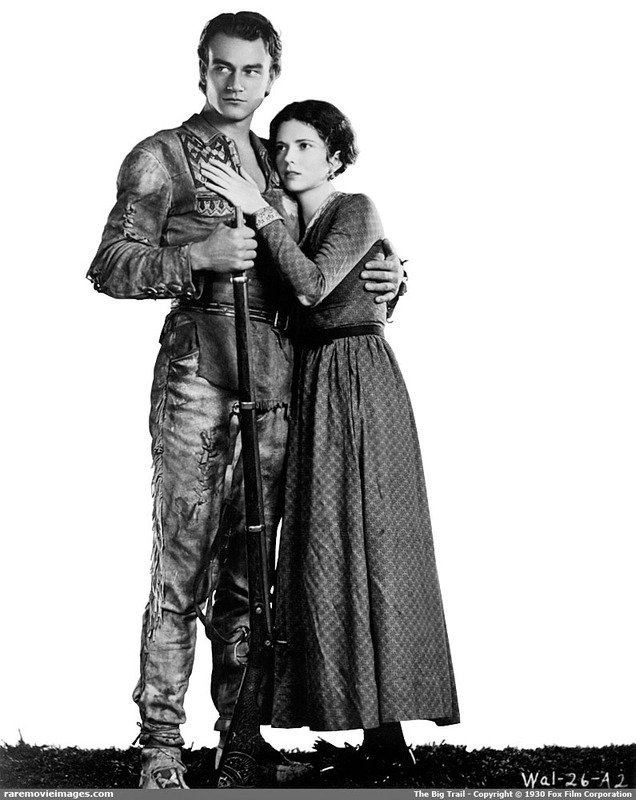 They would work together again in Red River and Angel and the Badman. This entry was posted in Westerns Worth Watching and tagged John Wayne, Northern Westerns, Randolph Scott on April 26, 2014 by Nicholas Chennault. This a revenge/manhunt western, mixed with a range war. And all this in a B movie starring good-looking but unexciting George Montgomery in his flat-crowned 1950s cowboy hats. The mysterious Tex (aka Jim Wall, played by George Montgomery) throws his lot in with a gang of rustlers led by Hank Hayes (Richard Boone). Boone and his men are on their way to work for crippled cattleman Bull Herrick (Bruce Bennett), figuring to steal his cattle. 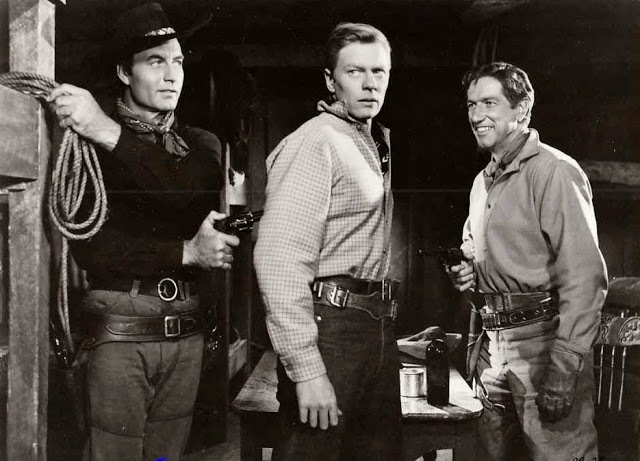 When they arrive, they find that Herrick has also hired a rival gang of rustlers led by Heesman (Peter Graves), figuring that the two bunches of thieves will keep each other honest. Herrick’s sister Helen (Sylvia Findley) has also arrived from the East, hoping to persuade her brother to return east with her for an operation that will restore his ability to walk and ride. 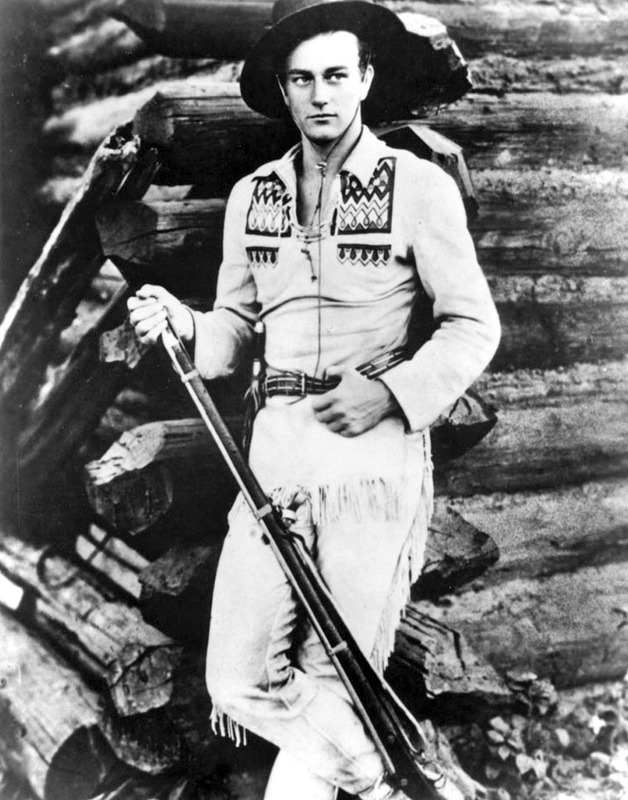 Also in the mix is neighboring rancher Robert Bell (William Hopper), who has asked Helen to marry him once before and still hopes to persuade her to say yes. 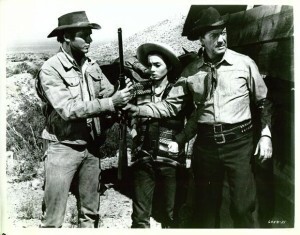 A good guy and two bad guys: Montgomery, Graves and Boone. But which is which? 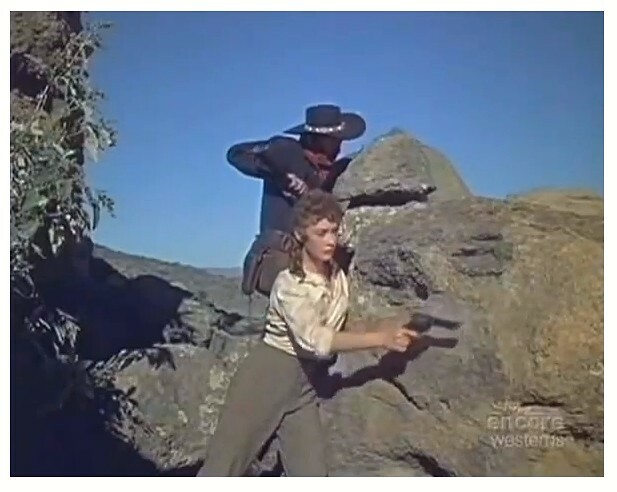 Tex, who is thought not to be very interested in women, becomes Helen’s riding companion, delegated by Hayes to keep her from seeing things he doesn’t want her to be aware of. Initially, the rivalry between gangs has the desired effect, but eventually they start cooperating to steal the entire herd. 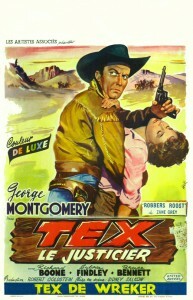 At the climax, Hayes makes off with the herd and Helen, with Tex trying to keep her safe. It turns out Hayes had robbed Tex’s ranch and raped and killed his wife, and Tex has been tracking him down not only for revenge but also to exonerate himself from murder charges. After a four-way shootout in the mountains (Hayes’ gang vs. Heesman’s gang vs. a posse led by the sheriff and Bell, while Tex and Helen are trying to escape and Hayes is trying to catch them). Luckily, Hayes doesn’t die before telling the sheriff about Tex’s innocence, and Tex and Helen ride off together. Tex and Helen try to hold out. George Montgomery’s Tex is remarkably taciturn, and he wears a quintessentially 1950s hat (short, flat crown and wide brim) as he usually did. Richard Boone’s Hayes is almost continually blinded by lust; this isn’t his best performance as a screen villain. The dying confession that absolved a wrongly-accused good guy became kind of a cliché in 1950s westerns, and it was often not terribly believable. There are weaknesses in the writing here, even if the star doesn’t talk much. 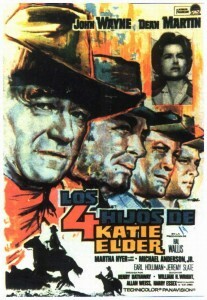 In color, filmed in Durango, Mexico, from a story by Zane Grey. 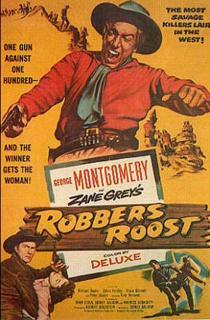 Historical note: There were a number of places in the west referred to as Robber’s Roost. They tended to be either where stages or mining coaches were often robbed (in Montana’s gold country near Bannack and Virginia City, or in southern Idaho’s Portneuf area, for example) or where outlaws sought refuge, as with the remote spot on the Outlaw Trail in the red-rock deserts of southern Utah where Butch Cassidy’s gang and others hid out. None of them had much to do with rustlers. This entry was posted in More Westerns and tagged George Montgomery, Range Wars, Richard Boone on April 25, 2014 by Nicholas Chennault. After retrieving the Domingo daughter Anisa (Ana Martin) from Cipar, Wyatt, Sutton and Anisa head for Lordsburg to find out who killed her parents. Turns out it was Lee’s older brother Clay Sutton (Lyle Bettger), who displays his unsuitability by cold-bloodedly shooting down the corrupt town judge and marshal (Mort Mills), who are both in his pocket. Lee must choose between Wyatt (who has saved him) and Anisa on one side, or his brother. 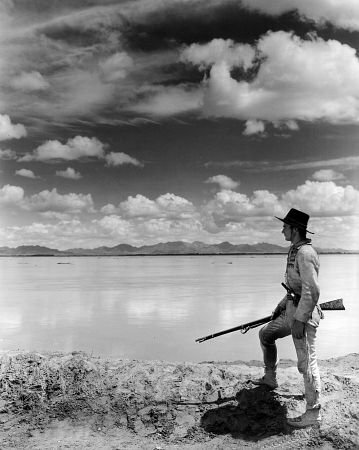 There is a final shootout in Lordsburg, and it turns out predictably. Taylor isn’t bad, but he looks tired, which is appropriate enough for this role. In fact, Taylor was gravely ill during the shooting of this film. The ending should have provided some form of resolution in the life of Ben Wyatt, and it doesn’t. The action should have more of an impact than it does. Everett isn’t great. There are a couple of holes in the plot. On the whole, this isn’t bad, though. Not much seen these days. Burt Kennedy is listed as one of the writers, with Robert Buckner. He was also starting to direct westerns about this time (Mail Order Bride, Young Billy Young), with his masterpiece (Support Your Local Sheriff) coming in two years. 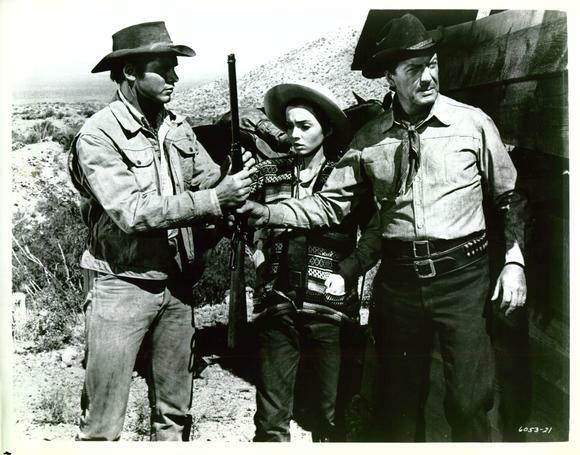 Lee Sutton (Chad Everett), Anisa (Ana Martin) and Ben Wyatt (Robert Taylor); Ana Martin and Robert Taylor on the set of Return of the Gunfighter. Taylor would be dead in two years, at the age of 57; this was his last western. For another western in which Robert Taylor plays a character named Wyatt, see him as Buck Wyatt in Westward the Women (1951). 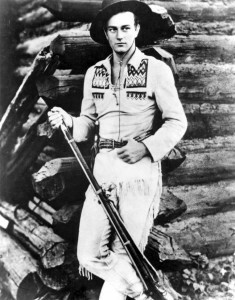 Chad Everett was a young, up-and-coming actor and appeared in a couple of westerns about this time before turning more completely to television (Medical Center). The other is The Last Challenge, with Glenn Ford (1967). Notes: The nefarious Clay Sutton has a couple of gunslingers working for him named Sundance (the snaky John Davis Chandler in a strange hat, also seen in a bit part as a bounty hunter in The Outlaw Josey Wales) and Butch Cassidy, both bad guys. The two historical outlaws did spend some time on New Mexico ranches, but not like this. This movie was released a couple of years before the George Roy Hill movie came out, making the outlaw pair into sympathetic good guys. Ostensibly the action takes place in 1878, but Lordsburg wasn’t founded until 1880. This entry was posted in Westerns Worth Watching and tagged Burt Kennedy, Range Wars, Robert Taylor on April 24, 2014 by Nicholas Chennault. This early talkie is interesting for two innovations: (1) 20th Century Fox was introducing its new proprietary “Grandeur” 70 mm widescreen picture format, more than twenty years before such widescreen images became common in movies, and (2) director Raoul Walsh selected for the lead a young man (23) who would become the most enduring star in westerns of the 20th century—John Wayne. Unfortunately the new widescreen format required extensive retooling of theatrical exhibition equipment and projection rooms, and in the depths of the Great Depression of the 1930s, few exhibitors had the funds to make those changes. John Wayne would have to wait almost a decade for stardom, and widescreen formats would have to wait another twenty years. John Wayne was a tall, good-looking former USC football player who had first gotten into movies during the 1920s by working as a prop man. 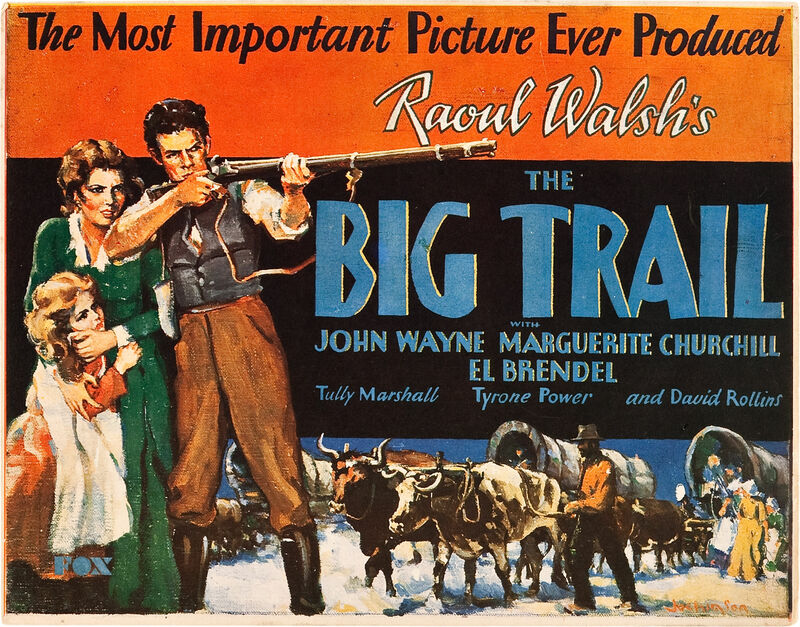 John Ford and others used him as an extra and in bit parts, but it was Raoul Walsh who first gave him a leading role here, as Breck Coleman, the scout for a wagon train headed west from Missouri. Coleman is looking for the murderers who had killed his best friend, a trapper, and stolen his wolf pelts. He decides to go along with the wagon train when he sees clues that the murderers might be with the train and when he is attracted to Ruth Cameron (Marguerite Churchill), a young woman heading west with her brother and sister. 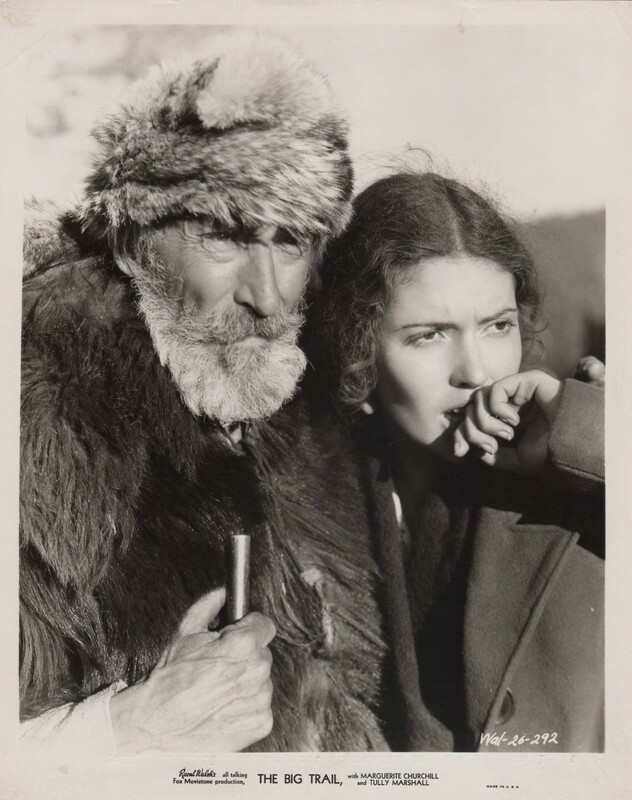 Red Flack, the rough wagon master (Tyrone Power Sr.), is not fond of Coleman, but there is nothing he can do. Gambler/gunman Bill Thorpe (Ian Keith) also joins the train to avoid being hung and because he too wants Ruth. Young John Wayne as scout Breck Coleman; Tully Marshall and Marguerite Churchill as Zeke and Ruth Cameron. As they head west across the plains, Coleman becomes more certain that Flack and his henchman Lopez (Charles Stevens) are his friend’s murderers, and Thorpe joins forces with them. 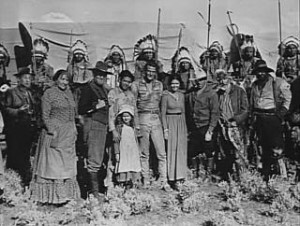 While Coleman is off hunting buffalo with a couple of Indian scouts, Thorpe ambushes him and sees him fall. 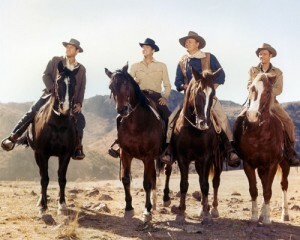 Thorpe, Flack and Lopez are surprised when he makes it back to camp with only a bullet hole in his saddle and no horse. The wagon train encounters the usual difficulties: hostile Indians, tough river crossings, steep canyon walls, heavy rains and other forms of rough country. 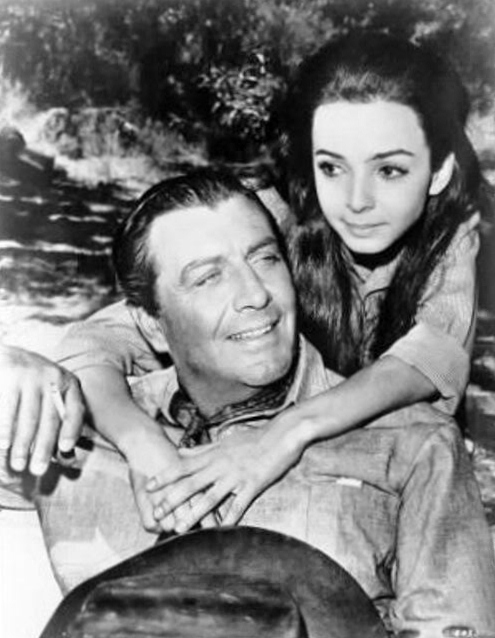 Thorpe persuades Ruth Cameron to leave the wagon train and head for California with him. As Coleman goes off to visit a friend, he is followed by Thorpe. When Thorpe draws his pistols to shoot Coleman in the back, he is instead shot by Coleman’s friend Zeke (Tully Marshall). For a moment, the entire camp, including Ruth, believe that Coleman is a murderer, until Zeke comes to his defense. Now the Cameron wagon has to stay with the main train. In snowy mountains, many are tempted to turn back until Coleman gives an impassioned speech, renewing their heart to forge on. 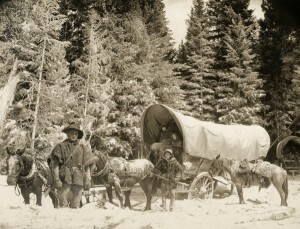 Flack and Lopez abandon the wagon train, but Coleman sees the train through to their destination in “the country beyond Oregon” (the tall trees look more like northern California). Ruth has finally decided she loves Coleman and begs him to stay with them. But he goes in search of Flack and Lopez, this time with a speech about how a man must make his own justice out west. By the time he finds them, Lopez has frozen to death, and Coleman gets the nefarious Flack just as Flack is trying to shoot him. As spring arrives in the pioneer valley, Ruth has decided that Coleman did not survive his dangerous mission of revenge or justice. But she encounters him in the tall trees, and their love is renewed. Fade to black, with symphonic music. Coleman and the villainous Red Flack (Tyrone Power); Coleman and Ruth Cameron. If you’re going to watch it now, see the restored version, at 122 minutes. “A financial disaster, the widescreen Big Trail vanished for 60 years, until the Museum of Modern Art restored it in the 1980s in a widescreen 35-millimeter print.” A two-disc DVD set was released in 2008. Some say the original cut was 156 minutes long, but if so, that longer version doesn’t seem to be available. 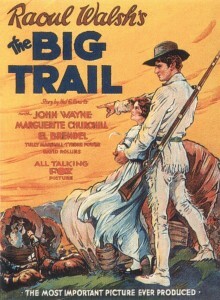 In 2006, the National Film Preservation Board included The Big Trail in the National Film Registry. The unknown John Wayne (the studio came up with that name for young Marion Morrison for this film, taking the last name from Revolutionary-era General “Mad Anthony” Wayne) does well and holds the screen. He is occasionally given stilted speeches and does the best he can with them, but he’s not yet the actor he will become. If the movie had been more successful, this might have been his big breakthrough. But it wasn’t, and he had to wait almost a decade for larger success to come in 1939’s Stagecoach. He spent the intervening years making eight-day and ten-day B movie westerns, in an era when almost all westerns were cheaply and quickly turned out, and there was no cinematic prestige attached to them. 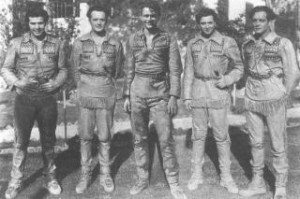 Wayne (center) with stand-ins and foreign language counterparts. Some of the other actors in the film, such as romantic interest Marguerite Churchill and Tyrone Power Sr. (playing the large and rough villain Red Flack with a growly voice), had stage backgrounds, and their acting is a bit broad for modern tastes. They had to project so their voices could be caught by the relatively primitive microphones. One of the trio of villains (Lopez) is played by Charles Stevens, a grandson of Geronimo, who played a number of Indian and Mexican characters (he had both Apache and Mexican ancestry) from the 1930s through the 1950s, in such films as Frontier Marshal and My Darling Clementine. El Brendel, the pseudo-Swedish “comedian” who plays the comic-relief immigrant Gussie, was actually Philadelphia-born Elmer Goodfellow Brendle, who had affected a phony German accent until the sinking of the Lusitania. Ward Bond (later the star of John Ford’s Wagon Master and TV’s Wagon Train series) was assigned by Walsh to manage the wagons, appropriately enough. Marguerite Churchill, the pretty heroine, wound up marrying George O’Brien, John Ford’s favorite leading man from 1924 to 1931. This movie, along with silent films The Covered Wagon (1923, directed by James Cruze) and The Iron Horse (1924, by director John Ford), constitute the great epics of western American expansion from the early decades of the movies. While the writing is clunky by current standards and the glories of Manifest Destiny don’t play as well to modern ears as they did to the audiences of the 1930s, this is paced well and has spectacular visuals. It’s fun to watch. If you watch Stagecoach soon after seeing The Big Trail, you’ll notice several improvements. One is that Stagecoach has noticeably better writing. Another is that in the intervening decade, sound equipment had improved dramatically in quality. And a third is that, by laboring in 40 or so B movies in the interim and taking advice from such veterans as Harry Carey, John Wayne’s acting skills were also a lot stronger. When his big break came again in 1939, he was a somewhat more mature 32, and he made the most of it. 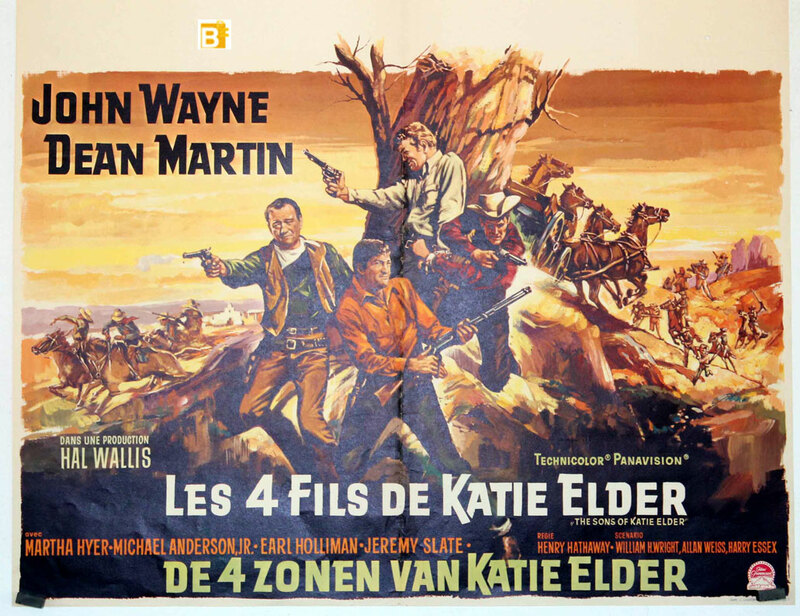 This entry was posted in Westerns Worth Watching and tagged John Wayne, Native Americans (Indians), Raoul Walsh, Wagon Trains on April 23, 2014 by Nicholas Chennault. Both a coming-of-age and a coming-of-death movie (perhaps similar to The Shootist in that regard, also with Ron Howard). 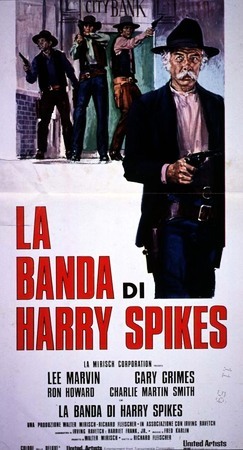 Lee Marvin is Harry Spikes, outlaw mentor to young friends Wil (Gary Grimes), Les (Ron Howard) and Tod (Charlie Martin Smith). After helping the wounded Spikes when they first encounter him, the young men have left home and bungled a bank robbery when they cross paths with Spikes again. He apparently takes a liking to them. They need considerable mentoring in simple survival out in the world, and Spikes leads them into a course in advanced bank robbery as well. In the end, they all die in a burst of 1970s iconoclasm, with Wil and Spikes killing each other in a shootout after Spikes turns bounty hunter and betrays the youngsters. Marvin is effective as always (with a really good turn-of-the-century mustache), and the three young men are good as well. There’s some good writing, but ultimately there’s also some slow pacing and a lot of nihilism here. Three-fourths of the gang: Ron Howard, Lee Marvin and Gary Grimes. Available on DVD as of 2011. As with other movies from the early 1970s, the blood looks a lot like paint. There’s some good writing in the dialogue, although the plot is a downer (kind of like The Culpepper Cattle Co. from the same era, also starring Grimes, who, for a brief period in the early 1970s specialized in coming-of-age movies). There a tone of unspoken regret, perhaps repentance, in the end. The film is obviously influenced by The Wild Bunch and Bonnie and Clyde of a few years earlier. Arthur Hunnicutt, in his last film, and Noah Beery, Jr., are good in brief roles. Shot in Spain. This entry was posted in More Westerns and tagged Coming of Age Stories, Lee Marvin, Revisionist Westerns on April 22, 2014 by Nicholas Chennault. 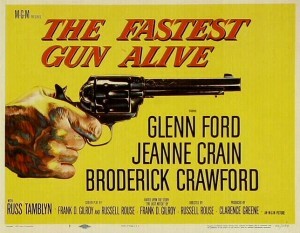 Heavy-set Broderick Crawford as a quick-draw bad guy named Vinnie? 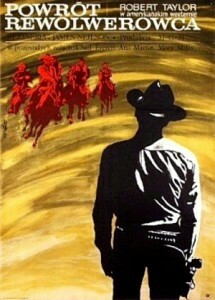 A psychological western with lots of angst, kind of 1950s Freudian. It is also a variation on the theme of how somebody quick with a gun draws others who want to test themselves against him (e.g., The Gunfighter). 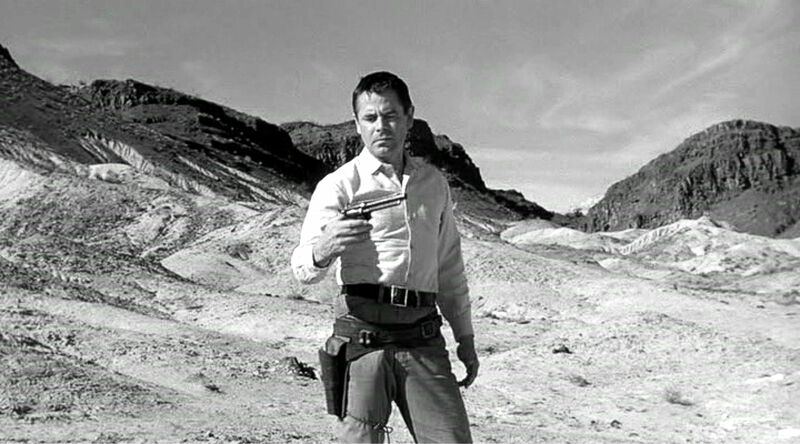 Storekeeper George Kelby/Temple (Glenn Ford) has father issues with his now-deceased lawman father, who was good with a gun until he was killed. Bad guy Vinnie’s insecurities are fueled by having been abandoned by his wife. Kelby/Temple is great with a gun and occasionally needs to show off his skills, but he has never shot a person and is afraid to do so. 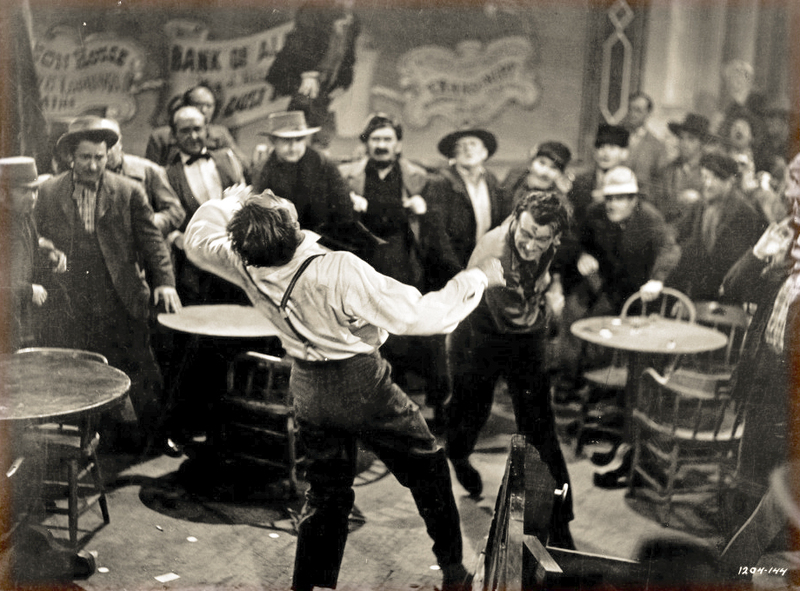 Vinnie, having robbed the bank in a neighboring town with his gang (John Dehner, Noah Beery, Jr.), is making his escape when he hears about Kelby’s skill. Fancying himself to be fast with a gun, Vinnie tries to force Kelby into a test showdown, or he’ll burn down the town. Kelby/Temple (Glenn Ford), wondering if he can do it. There is much anguish as Kelby and other townsfolk take refuge in the church and debate whether he has to take up Vinnie’s challenge and save the town. His wife (Jeanne Crain) doesn’t want him to do it. One townsman (Leif Erickson) reluctantly volunteers to impersonate George to save the town. Finally Kelby steps up, as we knew he eventually would have to. But he doesn’t like it. “Don’t say a word, Lou…because a word is about all it would take.” George walks out into the dusty street …. Cut to the posse pursuing Vinnie et al., finally arriving in town. They find only graves in the churchyard, including one for Vinnie and one for George Temple. He has been buried with his gun. Only the living storekeeper George Kelby remains. Theoretically, all of the anguish is resolved at the end of the movie, but it seems like the need to demonstrate his skills will come back, even though his father’s gun is now buried and gone with Vinnie. This has a good supporting cast, including Noah Beery, Jr. and John Dehner as the other two members of Vinnie’s gang. There are a lot of 1950’s “gunman and the community” issues, with a lot of ambivalence among townsmen about how to deal with Vinnie, the role they want Kelby/Temple to play, and how they feel about him. In black and white, at 89 minutes. Glenn Ford was at the peak of his career in westerns, although he always played roles other than westerns, too (Teahouse of the August Moon, Don’t Go Near the Water). This was about the time that he made 3:10 to Yuma, Jubal and Cowboy with director Delmer Daves and The Sheepman. For a similar theme with Fred MacMurray, see At Gunpoint. This entry was posted in Westerns Worth Watching and tagged Glenn Ford, Lawman and Community, Psychological Westerns on April 21, 2014 by Nicholas Chennault. This anguished retelling of the Billy the Kid story, with overwrought psychological overtones, was the directing debut of Arthur Penn and the first film for producer Fred Coe. It depicts the usual events (e.g., the killing of John Tunstall, Billy’s English employer, and Billy’s escape from jail and killing of deputy Bob Ollinger [Denver Pyle]) without sticking very closely to the historical details. .
Paul Newman conveys Billy’s immaturity and poor impulse control, although at 33 he was not as young as Billy was and certainly doesn’t look much like him. James Dean was originally signed for this role but didn’t live to play Billy. The script emphasizes Billy’s illiteracy and certainly doesn’t make him a hero. John Dehner’s Pat Garrett might be the best portrayal here, although he, too, seems overwrought at times. And there are pacing problems, too. The final scene, Garrett’s killing of Billy, takes place at night but otherwise doesn’t much resemble the actual events. Here, the anti-heroic Billy is unarmed but maneuvers Garrett into shooting him in the half light; he then falls on his back across wooden rails in a position that suggests crucifixion. There’s also the strange character of Moultrie (Hurd Hatfield), who seems driven to mythologize Billy and then betray him when he feels himself betrayed. Newman as The Kid (using his left hand, of course), and The Real Kid. The screenplay is based on a play by Gore Vidal, and maybe that accounts for some of the anguish. In some ways it foreshadows Penn’s Bonnie and Clyde ten years later, with the alienation of the undereducated outcast. 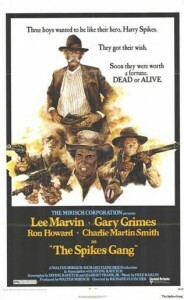 Peckinpah’s later (1973) version of the story is more historically accurate, although it has its own problems. In black and white. This is an early western by Arthur Penn, who was not known for making westerns. Indeed, it was his first film of any kind. 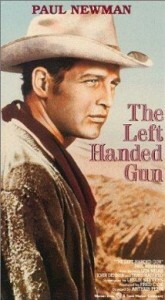 He is best remembered for 1967’s Bonnie and Clyde and the revisionist western Little Big Man in 1970. This was a flop at the box office in the U.S., but was praised by French film critics. Historical note: The title of this film comes from the only known photographic image of Billy, a scratched-up thing that shows him holding a rifle and wearing his pistol on the left. (Somehow the left-handedness seems to be another detail that suggests Billy was off kilter.) More recently, research suggests that the image was flipped in development, and that Billy was really right handed. He was still kind of squirelly and unduly given to violence, but he didn’t particularly use his gun with his left hand. 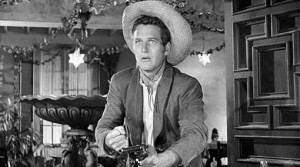 This entry was posted in Westerns Worth Watching and tagged Arthur Penn, Billy the Kid, Paul Newman, Psychological Westerns on April 19, 2014 by Nicholas Chennault. 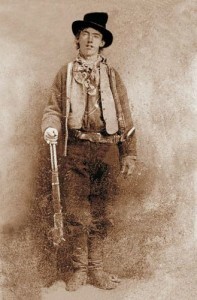 Strange version of the Billy the Kid story, with Jack Beutel as the Kid. Finished in 1941 but not exhibited until 1943 because of fights over censorship. The real star of this was the sultry young Jane Russell in her first movie role, with her Howard Hughes-engineered bra (which she never really wore), as the Kid’s eventual romantic interest Rio. Thomas Mitchell is a strange choice to play Pat Garrett, and Walter Huston is brought in as a much-too-old Doc Holliday. Newly appointed sheriff Pat Garrett (Mitchell) is pleased when his old friend Doc Holliday arrives in Lincoln, New Mexico, on the stage. 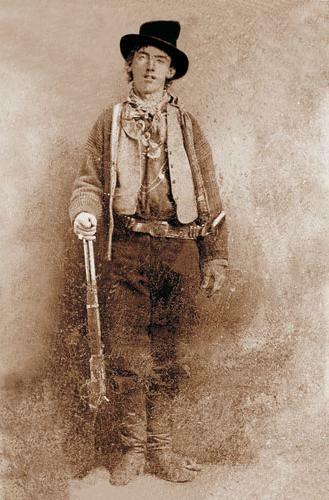 Doc is trailing his stolen horse, and it is discovered in the possession of Billy the Kid (Beutel). In a surprising turn of events, Billy and Doc become friends. This association cools the friendship between Doc and Pat. The odd relationship between Doc and Billy grows stranger when Doc hides Billy at the place of his girl Rio after Billy is shot. She falls for Billy, although he treats her very badly. Interaction between these four is played out against an Indian attack before a final showdown reduces the group’s number. Beutel and Russell as Billy the Kid and Rio; Thomas Mitchell as Pat Garrett. By the end of the movie, Holliday is dead in a grave marked Billy the Kid, and the Kid is allowed to ride off with Rio, presumably to a happy family life and old age. None of this makes much sense. Beutel is not terribly charismatic in the role of Billy. 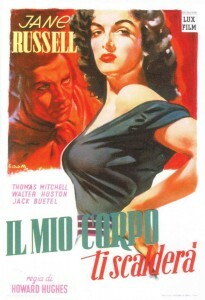 The script was written by Jules Furthman, who wrote or co-wrote several excellent movies made by Howard Hawks: To Have and Have Not, The Big Sleep and Rio Bravo, for example. Hawks started as the director here but quit after two weeks. It had a lot of censorship problems and is more interesting for historical filmmaking reasons than as an actual movie. 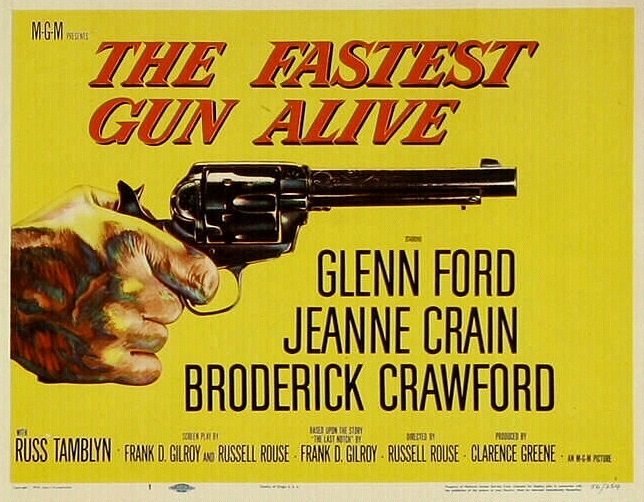 For hard-core western fans, it featured the uncredited movie debut of Ben Johnson. 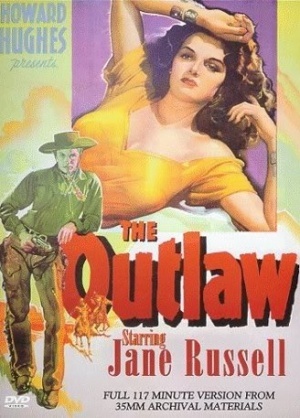 Seventy years later, the dominant image from this film is not the black-clad Billy or Doc Holliday or Pat Garrett, but the voluptuous Jane Russell, reclining provocatively in the hay. 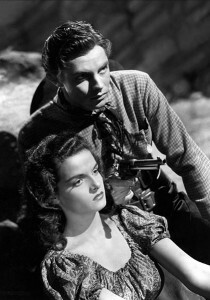 Beutel never amounted to much in the movies (look for him a decade later in Best of the Badmen), but Jane Russell went on to a respectable film career. Historically, Pat Garrett and Billy were the friends (or at least acquaintances), not Garrett and Doc–at least until Garrett killed the Kid. Except for the location (Lincoln County, New Mexico) and the names of a few of the characters, this movie never comes close to anything historical. This film may be more notable for the fights it engendered, between Howard Hughes and the censors and later between Hughes and Howard Hawks, than for anything in the film itself. An interesting historical footnote is why this delayed the release of the classic Red River for two years. Red River was shot in 1946; it was Howard Hawks’ first western. A still-irate and growing-ever-stranger Howard Hughes brought a legal action claiming that Hawks had stolen elements of his trail-drive epic from Hughes’ Billy the Kid story. The Hughes claims were baseless, but sorting them out meant that Red River wasn’t released until 1948. Unlike this bomb, Red River remains a classic and one of the greatest westerns to this day. Take that, Howard Hughes. This entry was posted in More Westerns and tagged Billy the Kid on April 18, 2014 by Nicholas Chennault.